The ‘Stockman Somerset’ training group played a game modelled on the BBC3 programme Snog, Marry, Avoid when it met for its first session this week. Not what they expected perhaps?! But the game of ‘Sell, Treat, Kill’ turned out to be popular with trainees, helping them decide how best to manage the ill or injured pigs they saw pictured during the training. 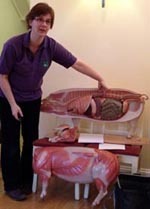 Annie Davis from The George Veterinary Group led the session and also covered the correct use, handling, storage and disposal of pig medicines. Service management is the next topic for the group when it meets again on 19 February in Shepton Mallet.